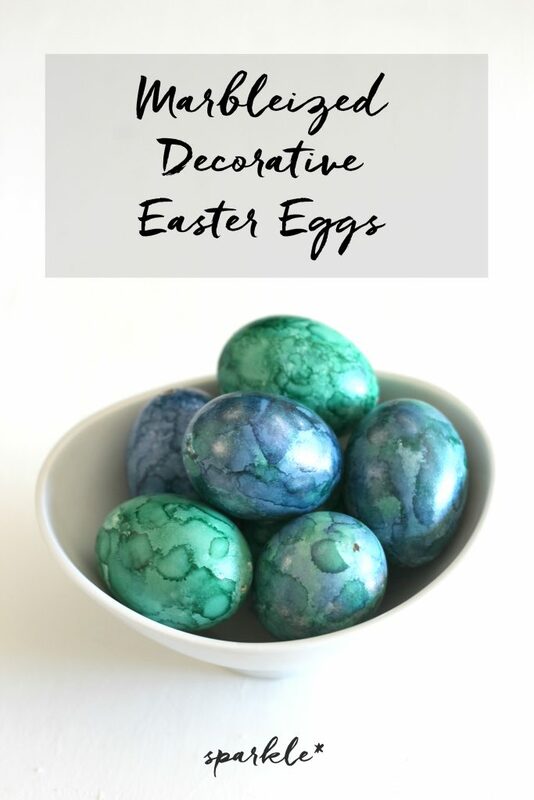 Make gorgeous decorative Easter eggs with this marbleizing technique using alcohol ink. I promise this will be the last Easter egg post for 2017. I just can’t help taking eggs and making them pretty. It’s addicting. These ones were decorated with alcohol ink. I used alcohol ink before with the Metallic Succulent Wreath, and love the marbled look it creates. 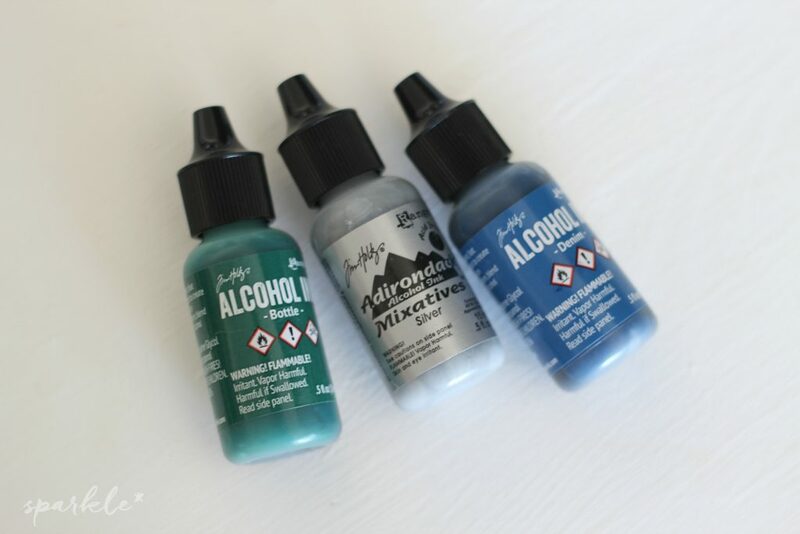 The alcohol in the ink evaporates quickly, so it dries fast and works great on non- porous materials like metal, plastic, shrink film, glossy paper, ceramic and glass. Alcohol ink is kind of stinky, so you want to use in a space with good air flow. Plus it’s flammable and harmful if swallowed, so keep it out of reach from kids, puppies, people who eats things they aren’t supposed to and combustible individuals (you know who they are.) Oh and don’t decorate eggs you plan on eating with this stuff. Get some fake eggs from the store, or poke holes in the top and bottom of raw eggs and blow the guts out of them. Decorative use only people! These eggs took all of 15 minutes to decorate. Quick, easy, gorgeous. 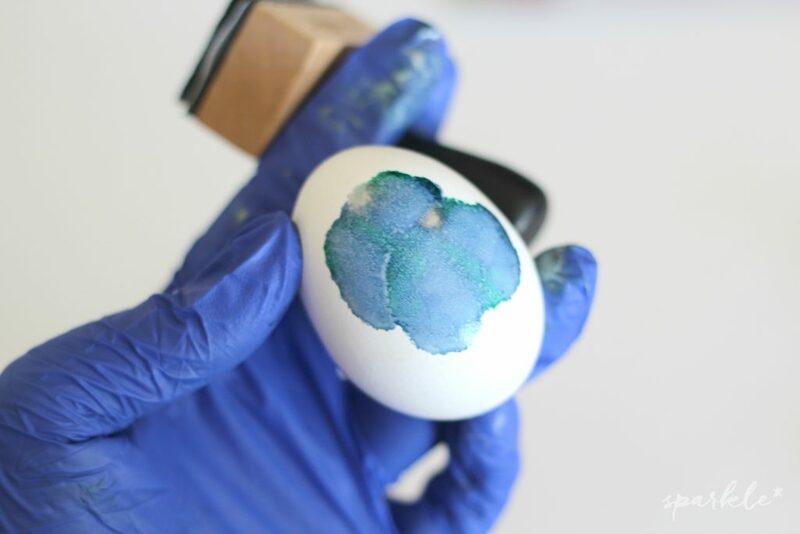 Make sure the outside of your eggs are clean and dry and put on your gloves so you don’t get ink all over your pretty manicure. 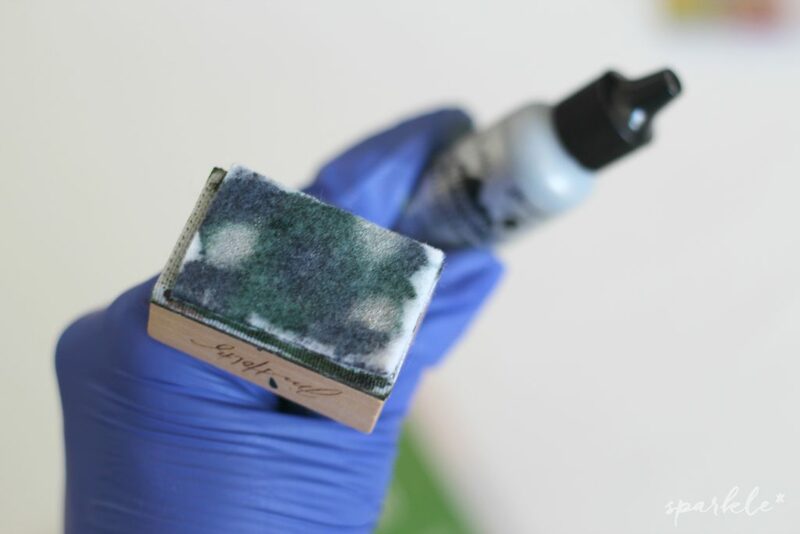 Add spots of ink to the felt on the applicator. I did some all green, some all blue, and some mixed with blue, green and silver. You can’t do it wrong. Dab the applicator on to the eggshell. Pretty, huh! 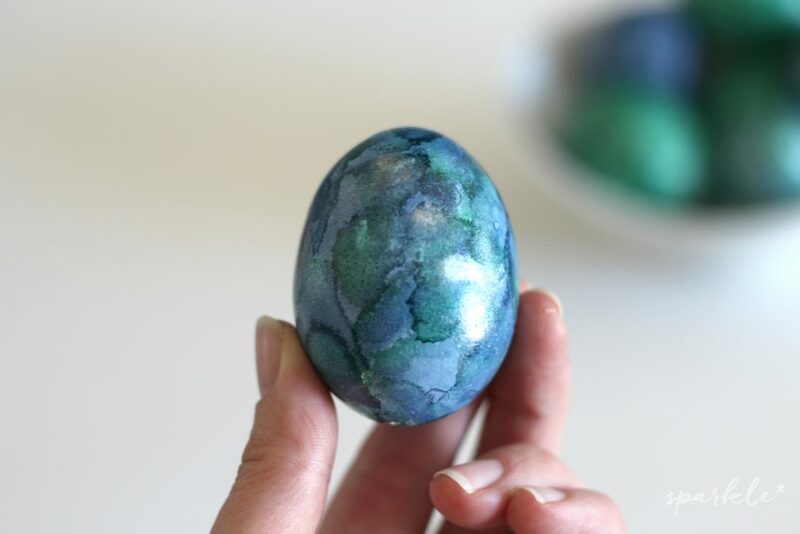 It gives the egg a marbleized, water color look. get the color all the way around. You can add another layer of color to get an even more unique look. The eggs can be coated with a glossy sealer if you’d like, but I found that the ink didn’t rub off or anything once dried and on the natural egg shell it had a satiny finish. They are like little works of art and probably my favorite Easter egg decorations yet. Of course I love the kaleidoscope eggs and the decoupaged floral eggs too. 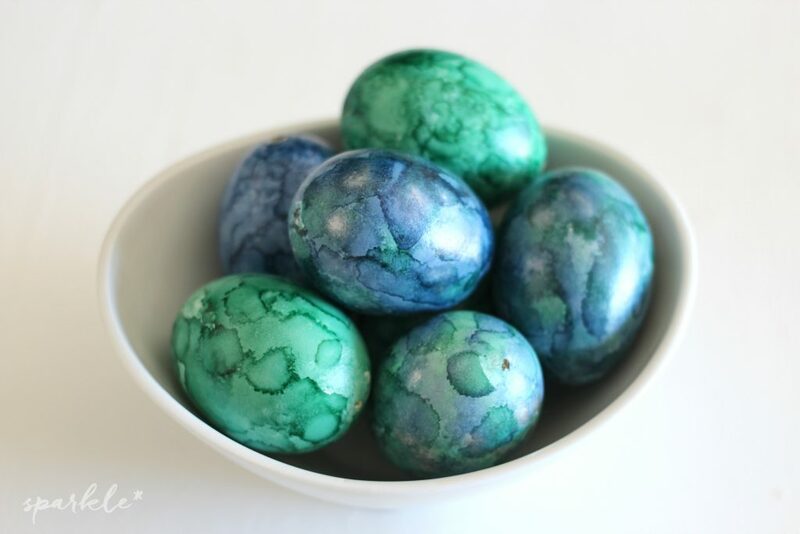 Wow…these eggs are absolutely gorgeous! Those are very unique and pretty. Thanks for sharing your post with us at the Family Joy Blog Link Party this week!